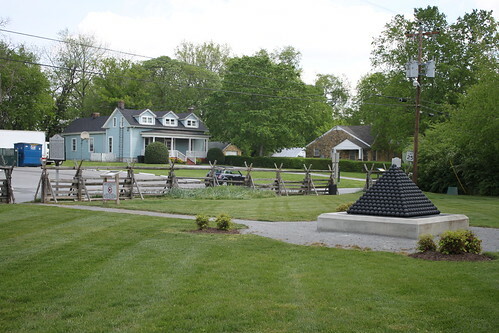 (Franklin, Tenn.)— October 19, 2012–The Battle of Franklin Trust Chief Operating Officer Eric A. Jacobson announced today at Carnton Plantation the discovery of several hundred documents, letter and orders of Confederate General John Bell Hood. While conducting research for an upcoming book on the general, West Virginia’s Sam Hood, a collateral descendent and student of the career of Hood, was invited to inspect a collection of the general’s papers, held by a descendent in Pennsylvania. Keith Bohannon, professor of history at the University of West Georgia, says most of Hood’s biographers assumed that Hood’s papers, other than those known to be archived, were lost or destroyed. “Some of John Bell Hood’s official papers made their way into the public record when he attempted to sell them to the Federal government near the time of his death in 1879,” Bohannon said. Hood and his wife, Anna Marie, both died in New Orleans from yellow fever and left behind ten orphaned children. Before his death at age 48, Hood was in poor financial condition and was working to sell some of his documents to better the financial plight of his family, according to Bohannon. “I have been fighting to right some of the misperceptions and vicious myths of General Hood for years,” added Sam Hood. “These documents will shed a lot of light that will change some of those views.” Hood is set for a spring release of his detailed point by point defense of General Hood’s career, entitled John Bell Hood: The Rise, Fall and Resurrection of a Confederate General, which will be published by Savas Beatie Publishing. As timing would have it, this volume was completed before this recent document discovery. Much of his book argues that known evidence before the recent cache find has been misinterpreted or blatantly misused by many contemporary authors. Hood critically notes several authors who he believes perpetuated the use of Hood as a target for Lost Cause architects. 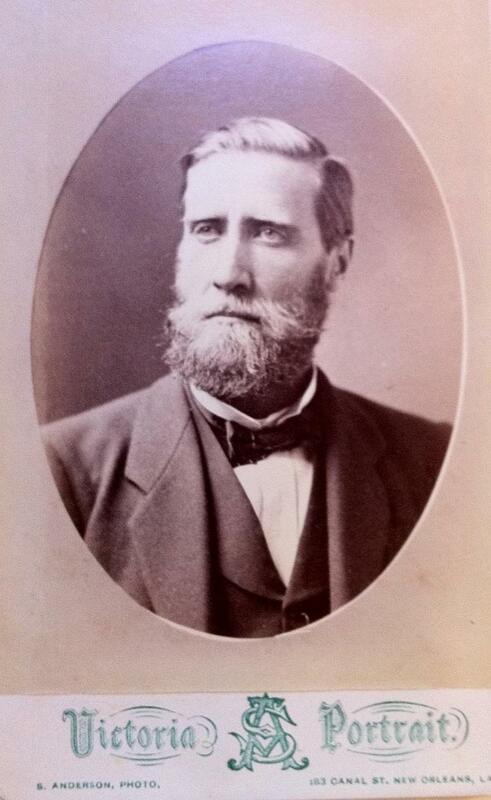 Some of the newly discovered information on the Atlanta Campaign, the Spring Hill affair, and the Battle of Franklin will be included in Sam Hood’s upcoming book, but since the total collection will take several months to transcribe, more important information on John Bell Hood – the man and the soldier – cannot, by necessity, be revealed until later. The Battle of Franklin Trust is a 501 (c) 3 management corporation acting on behalf of Franklin’s battlefield sites to contribute to a greater understanding and enrich the visitor experience of the November 30, 1864 battle. It’s organized for the charitable and educational purposes of preserving, restoring, maintaining and interpreting the properties, artifacts and documents related to the battle so as to preserve an important part of the nation’s history. Colonel First Regiment Arkansas Infantry,–, 1861. Brigadier general, P. A. C. S., March 4, 1862. Major general, P. A. C. S., December 13, 1862. Killed at the battle of Franklin, Tennessee, November 30, 1864. Brigade composed of the Second, Fifth, Twenty-fourth and Forty-eighth Tennessee and Fifteenth Arkansas Regiments Infantry, and Calvert’s Battery of Artillery, being Second Brigade, Third Corps, Army of the Mississippi. Division composed of the brigades of Brigadier Generals Lucius E. Polk, S. A. M. Wood, and James Deshler, and the batteries of artillery of Calvert, Semple, and Douglass. Division subsequently composed of the brigades of Brigadier Generals L. E. Polk, Lowry, Govan, and Granbury, and subsequently of the brigades of Brigadier Generals Wood, Johnson, Liddell, and Polk, Hardee’s Corps, Army of Tennessee. 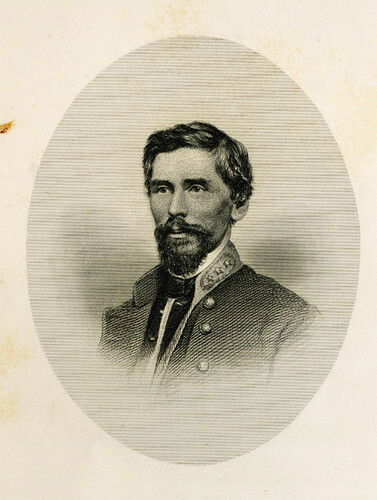 Major-General Patrick R. Cleburne, one of the most brilliant soldiers of the Confederate States, was a native of Ireland. When twenty-two years of age he joined the British army as a private, and there took his first lessons in drill and discipline. For good conduct he was promoted to the rank of corporal. After remaining three years in the British army he procured his discharge and came to America. He settled in Arkansas, became a hard student, was admitted to the bar, and the year 1861 found him practicing law in Helena, enjoying in his profession and in society the honorable position which his toil and native worth had gained for him. He was among the first to answer the call to arms. He raised a company and with it joined the First, afterward known as the Fifteenth Arkansas regiment, of which he was almost unanimously elected colonel. His first campaign was with General Hardee in Missouri. At its close he went with Hardee to Bowling Green, Ky. He had during this short military service so impressed his superiors that he was assigned to command of a brigade, and on March 4, 1862, was commissioned brigadier-general. At the battle of Shiloh he proved that his abilities had not been over estimated, and during the reorganization of the army at Tupelo he brought his brigade to a very high state of discipline and efficiency. He had that valuable combination of qualifications for command which enabled him to enforce discipline and at the same time secure the esteem and confidence of his troops. At Richmond, Ky., he commanded a division whose impetuous charge had much to do with winning the magnificent victory over “Bull” Nelson’s army. Though painfully wounded in this battle, a few weeks later he led his men in the fierce conflict at Perryville, with his usual success. 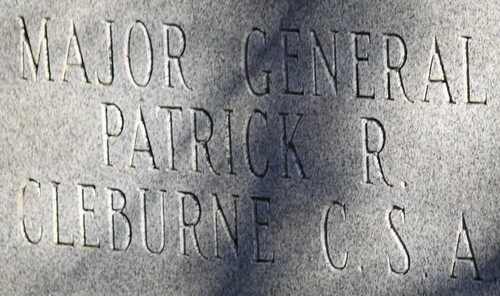 On December 13, 1862, he was commissioned major-general. He was in the memorable attack upon the right of the Federal army at Murfreesboro, which drove the Union on lines until the mass in front became at last too thick for further penetration. Again at Chickamauga Cleburne made a charge, in which his men by desperate valor won and held a position that had been assailed time and again without success. 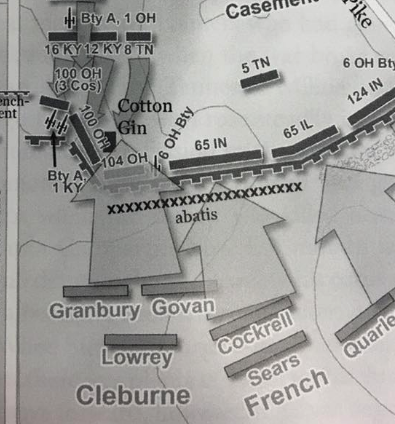 One of the most brilliant episodes of the Atlanta campaign of 1864 was Cleburne’s victory at Pickett’s mill over Howard’s corps of Sherman’s army. In the awful carnage at Franklin, November 30, 1864, Cleburne, the “Stonewall Jackson of the West,” gave his last battle order. Within twenty paces of the Union line, pierced by three wounds, he fell, and on the battlefield expired. His death was a disheartening blow to the army of Tennessee, and was mourned throughout the whole South. 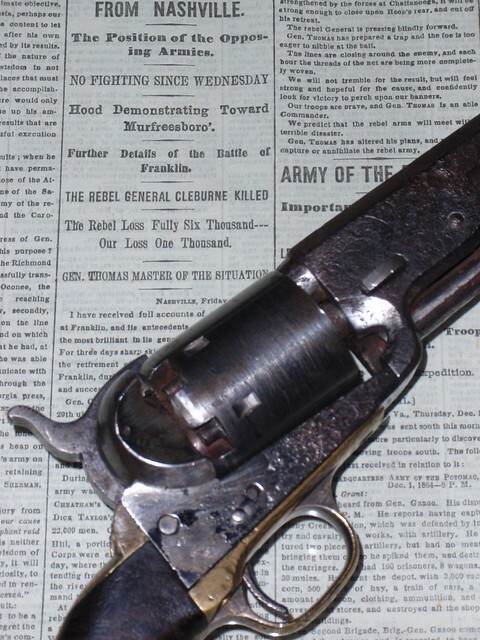 The original pistol used by Cleburne at Franklin. 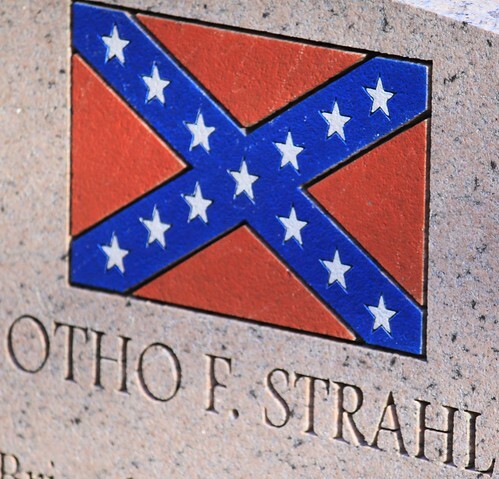 General Otho French Strahl, one of the choicest spirits that embraced the cause of the South, and finally offered all upon her altar, was a native of Ohio, who had settled in Tennessee and was practicing law at Dyersburg when the great war of States began. Although of Northern birth, both of his grandmothers were Southern women, and perhaps had much to do with moulding the sentiments which made him such an ardent sympathizer with the South. 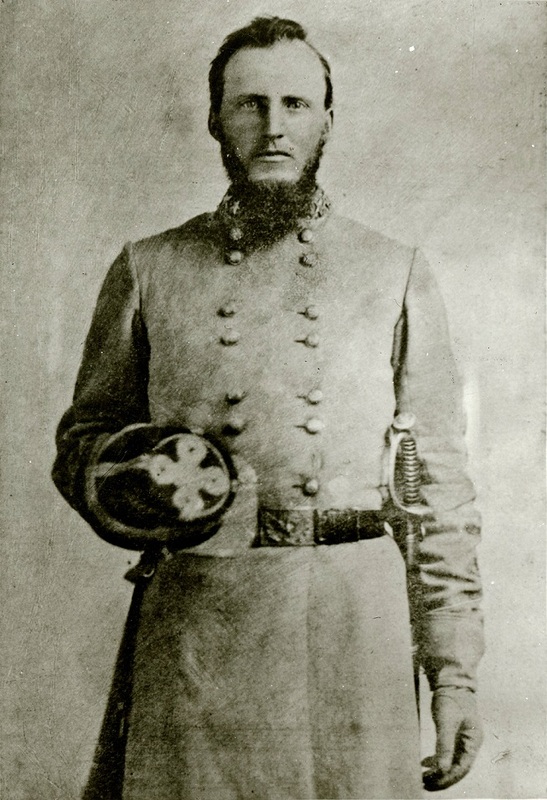 When Tennessee was making ready to cast in her lot with the Southern Confederacy, the young lawyer entered the Fourth Tennessee regiment as a captain (May, 1861). Early in 1862 he became lieutenant-colonel of the regiment. 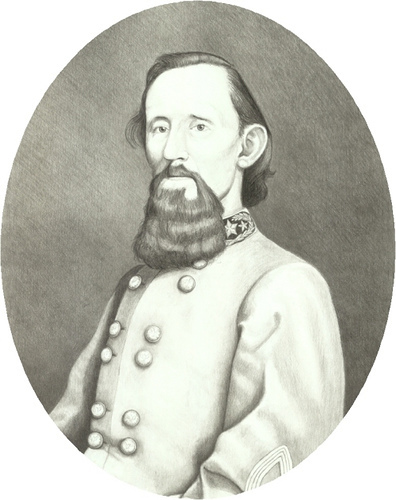 As such he shared in the hardships and glories of the campaigns of Shiloh, Bentonville and Murfreesboro, in which he so conducted himself as to be promoted colonel early in 1863, and then to the rank of brigadier-general, July 28, 1863. In the hundred days’ campaign from Dalton to Atlanta in 1864, he and his men added to their already magnificent record. Mr. S. A. Cunningham, who was a boy soldier in his brigade at Franklin, November 30, 1864, has given in his magazine a graphic account of the conduct and death of his commander on that fateful day. Mr. Cunningham being that day right guide to the brigade, was near Strahl in the fatal advance, and was pained at the extreme sadness in his face. He was surprised, too, that his general went into the battle on foot. The account of Mr. Cunningham continues: “I was near General Strahl, who stood in the ditch and handed up guns to those posted to fire them. I had passed to him my short Enfield (noted in the regiment) about the sixth time. The man who had been firing, cocked it and was taking deliberate aim when he was shot, and tumbled down dead into the ditch upon those killed before him. While the army was camped at Dalton on the 20th of April, 1864, services were held in the Methodist church by Bishop Charles Todd Quintard, of the Episcopal church. On this occasion Bishop Quintard baptized General Strahl and presented him to Bishop Stephen Elliott for confirmation, with three other generals of the Confederate army — Lieutenant-General Hardee and Brigadier-Generals Shoup and Govan.